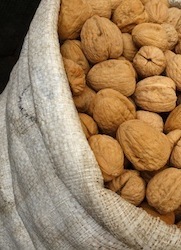 Walnuts are one of the healthiest nuts you can eat. They're loaded with anti-oxidants, anti-inflammatory, heart healthy omega-3 fatty acids and provide more antioxidants than Brazil nuts, pistachios, pecans, peanuts, almonds, macadamias, cashews, and hazelnuts. There are over 700 peer-reviewed publications on walnut rearch. Walnuts are also a great source of protein and fiber. Top yogurt or salad with a handful of walnuts or eat raw walnuts as a snack.